Timber Lake Resort boasts some of the most diverse natural beauty in Illinois including two spring fed lakes and 100 acres of timber. New lodging facilities include 3 log cabins with private bath and housekeeping services, 42 pull thru RV campsites with water, septic, electric, phone and TV hookups, and 30 beautiful lakeside tent camping sites. Make sure you leave time to visit our famous Timber Lake Playhouse which has been providing live entertainment to Midwest audiences for over 40 years. 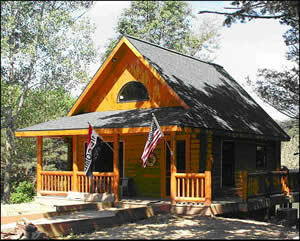 Golf, horseback riding, biking, boating, fishing and antiquing are all available in the area. Located just two miles south of Route 64 in Mount Carroll. 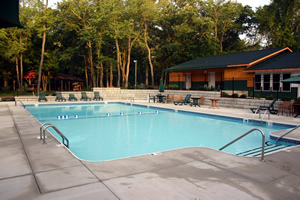 Timber Lake Resort also has great new facilities to socialize and have fun with your neighbors including a swimming pool, recreation hall, large group pavilion and a general store and lakeside deck.